We are a family-owned, full service propane filling station for residential, commercial, industrial and agriculture clients. We pride ourselves on personalized service and our competitive pricing. Our staff of knowledgeable employees is on hand to assist you and answer any questions. 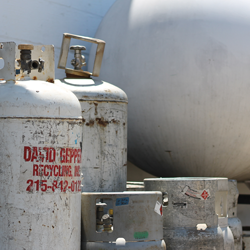 We can refill all types of propane tank sizes: BBQ Grill tanks, RVs, campers, as well as propane forklift tanks. We offer competitive propane prices on LP gas by the gallon, seven days a week. Refilling your propane tank is cheaper than exchanging. If you exchange your propane tank, you do not get credit for any propane that was left in the tank. Get your propane tank refilled by one of our professionals at Geppert’s Propane Refilling Stations and pay for only the propane you need. We take pride in every sale we make, tank we fill and customer we satisfy. At Geppert we treat all of our customers like family. Call or stop by today.